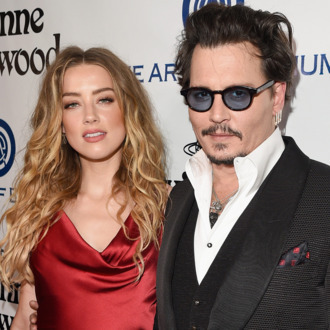 Days after Amber Heard filed for divorce from Johnny Depp, TMZ reports that Heard is seeking a restraining order against Depp and citing domestic abuse. Heard reportedly arrived in court on Friday with a bruised face and has requested a temporary restraining order due to an immediate threat of harm. She claims Depp physically assaulted her on Saturday and offered her money to “stay quiet,” after which she filed for divorce on Monday. (TMZ notes that Depp has been out of town promoting Alice Through the Looking Glass since Wednesday.) Heard says she has been the victim of repeated domestic violence during their one-year marriage, bringing photos allegedly containing evidence of abuse with her to court. TMZ has obtained a photo of Heard’s injury, which shows a large bruise around one of her eyes. Update: TMZ reports that a judge has granted Heard a temporary restraining order that requires Depp to stay 100 yards away from her. A hearing has been set for next month. Conflicting reports say Depp was present in court with Heard.